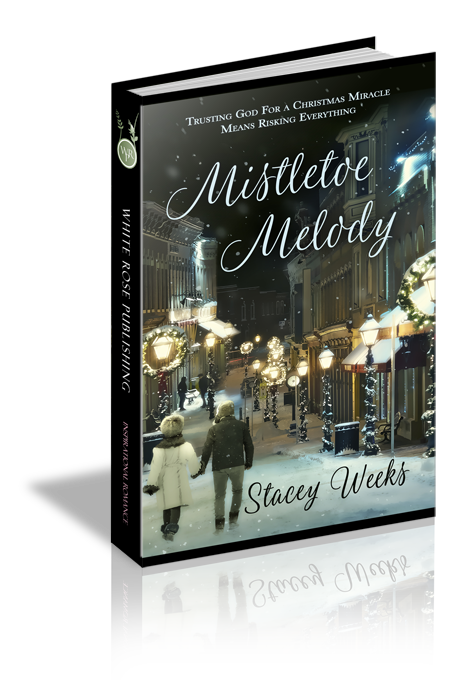 Former musician, Melody Staff, spends Christmas at a bed and breakfast in the village of Mistletoe Meadows. While everyone sings familiar carols of Christ drawing near, Melody stumbles over misplaced notes. Her recent diagnosis of Multiple Sclerosis has scared off her fiancé and thrust her life into a grand pause. She's not sure her heart will ever sing again. Quentin Oxford has endured a devastating year. His preteen daughter suffered a stroke, and they’ve grieved his wife’s sudden death, but the Lord coaxes a surprising refrain from Quentin’s heart as God rewrites his and Melody’s score into a holiday love song that will last for Christmases to come. She accepted his offered hand and warmth swallowed her fingers. His firm grip tugged her a tiny bit closer to him. It would have thrown her off balance had he not reached with his other hand to steady her. He gently squeezed her upper arm before letting her go. He radiated safety and care, which was not the Quentin she remembered. “That’s OK. We didn’t run in the same circles back then,” she said. Red crept up his neck. Had she offended or embarrassed him? She didn’t know him well enough to guess. Quentin scooped up her suitcase. “Can I help you with something else?” His gaze roamed up and down her as if he was looking for a need he might be able to meet. She tingled at his attention. It had been a long time since a man outside of her family or team of physicians looked at her with such interest. She noticed a wedding band style ring on his right hand. Interesting. She shifted her weight from foot to foot and swooped her long hair away from her face and over one shoulder. “I’m on a gluten-free diet. Are the cookies, by any chance, safe?” She hated having to ask, especially since it sounded as if his daughter had made them, but she couldn’t take the risk of accidentally ingesting gluten. She’d worked too hard to get into the drug trial, and she wasn’t going to blow it over a Christmas indulgence.